After a 3 day delay because of a sickness bug the E litter have finally left to go to their new homes. Since our last blog the pups have continued to thrive spending lots of time outdoors. Here are a few pictures of the pups enjoying themselves. 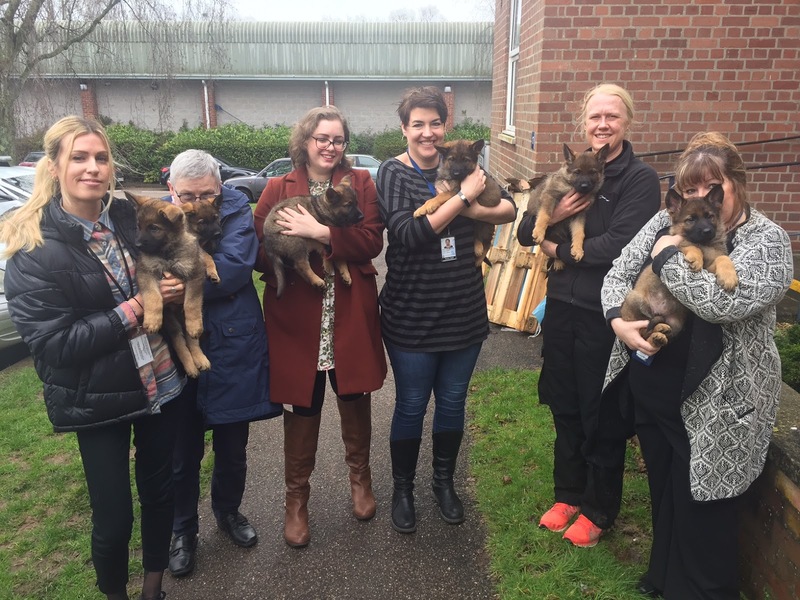 Since they were 5 weeks they have made regular visits to Police headquarters to meet the staff. They love having their meals outside in our garden. When I let them outside for their food it’s a bit of a race to get their before them to make sure everyone gets their fair share. Sasha has been the most amazing mum and her temperament is outstanding. She greets visitors and allows them to interact with the pups and she allows Ella to investigate them also. Here are Sasha and Ella in the garden together. I run them both together at Killerton National trust park in the morning and evening. As you read this blog you will notice how much mum Sasha loves interacting and being with her pups. 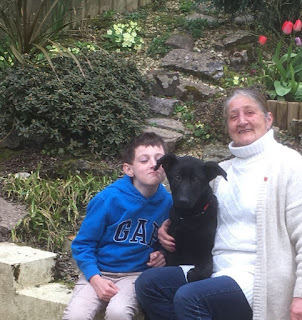 Sitting in the garden I get quite emotional sometimes watching her interacting with her pups and seeing the pups playing around the apple tree which I planted when I buried my beloved and much adored Police dog champion Spud. The pups are very advanced and forward for their age. We are lucky to have a very large garden and to keep them stimulated I opened the whole garden for them to explore. Here they are being let out of their existing garden area into the rest of the garden. Friday the 13th was the day that the pups were assessed as to their potential to be future Police dogs. Here I am giving them a briefing before we set off on the 45 mile journey to Plymouth where my friend and Mentor Graham Mabbutt assessed them at his house. The scientists tell us that at 7 weeks or 49 days old the pups nervous system and brain is fully formed and that this is the time to assess their characters. We assess their confidence when being placed individually in a room they have never been before with an assessor they have never met before. Here is Errol confidently exploring the room and investigating the assessor. We assess their desire to play retrieve and tug games. We assess whether they are sensitive to height, noise, or panic when restricted. We assess their sociability and desire to recall to breeder and assessor. Here is Eyke playing tug of war with the assessor Graham Mabbutt now in his 87th year and still as passionate about dogs as he ever was. 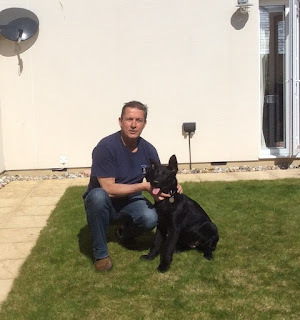 Here is Eyke showing a calmness as Graham gently places him in the down position. Here is Eddie being assessed for height sensitivity. Eddie is completely unfazed with the table being slightly rocked and shows no sign of panic. We assess their pain threshold to see if they are overly sensitive to pain. Here is Eddie showing no acknowledgement of Graham gradually squeezing his toe harder as he counts to ten. We assess their reaction to an unexpected occurrence which on this occasion was a small umbrella suddenly opening above them. The umbrella is then thrown to the side and we see if the puppy is worried by this and if it has the confidence to investigate it. Echo is completely unconcerned by this. Here is Ernie happily retrieving a ball with a small bell inside it. Here is Elsie playing with a toy dog and is completely unaffected by the siren being sounded above her. All 6 passed the assessment and 4 of them Ernie, Eyke, Eddie and Echo passed with distinction. The assessments are just a guide and this is taken into account along with the breeders observations during the weeks he/she raises the litter. Overall we are looking for general confidence and most important a determination and strong desire to play. So after an impressive assessment it was home for them all to have a well-earned lunch. He we are arriving home. The difficult job now was selecting 4 pups to go into our puppy program and 2 to go to civilian homes. My inclination was to keep all 6 after seeing them perform in their assessments but unfortunately we only had places for 4 pups in the program. Here I am briefing the gang on how well they had all assessed. The pups were due to go to their new homes on Saturday 21st April but they all became ill with diarrhoea and sickness the day after their inoculations on the Thursday. 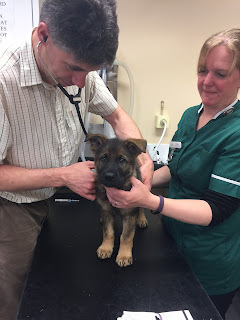 Here is Eddie having his check up and inoculation. As a result their leaving date had to be postponed until Tuesday 24th April. Here they all are looking pretty worse for wear the next day. On the Friday the 2 girls Echo and Elsie were still under the weather and were not particularly happy with the boys who had by now recovered and were charging around jumping on them. I then witnessed an amazing event when mum Sasha realising the girls were suffering stayed with them and physically prevented the boys getting to them. As the leaving day approached Eyke and Errol became regular escapees out of the exercise area. Here is Errol having climbed over the sofa I used to block them in relaxing on the seat. Elsie and Echo were always together and although they were more than capable of standing up for themselves they did find the boys behaviour somewhat tedious on occasions. Also by now my wife Di was finding it increasingly difficult getting out of their exercise area in one piece. 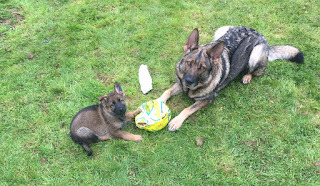 The one memory that will stay with me forever from the E litter is the obvious pleasure and joy Sasha got from being able to spend time with her pups whenever she wanted to. The fact that she had stopped feeding them nearly 5 weeks previously made no difference to her desire to be with them. Here are some photo’s of their time together. I am aware many breeders remove mum from the litter at an early age and many would argue that mum is able to cope and adapt to this. I would just say look at the following video’s and see for yourself the wonderful experience you are depriving mum of. Here are the pups showing their remarkable focus and attention. 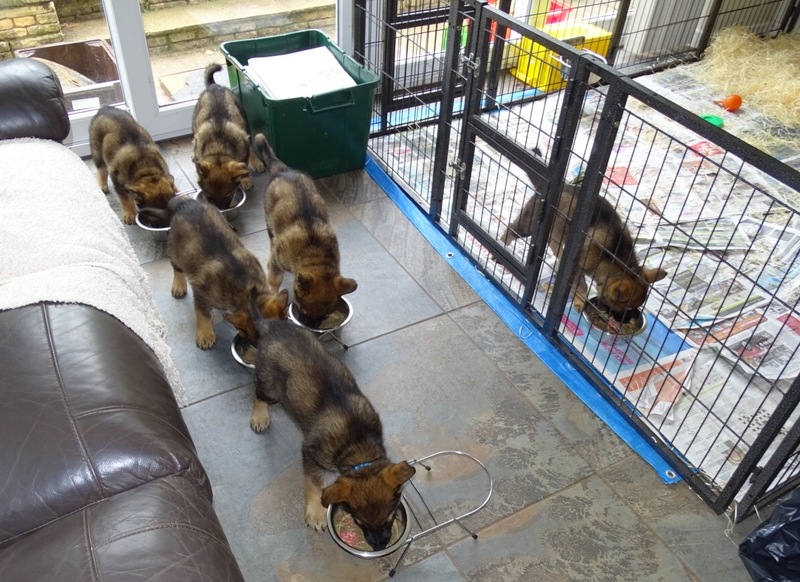 The day finally arrived for the pups to leave us and I had made the decision that Eyke, Errol, Ernie and Eddie were staying in the program and would be going to puppy walkers. With a heavy heart I decided to sell Echo and Elsie to members of the public who had been waiting for a puppy. But at the last minute one of the buyers had to withdraw and so Echo will now also remain in the program. Elsie is going to a very enthusiastic man called Sam from Plymouth who has been asking me for a pup for some time. He will be training with my friend and Mentor Graham Mabbutt which means I will still get to see Elsie. Here we all are on the morning of Tuesday with all of the puppy walkers and Sam about to start their journeys home with their new pups. From left to right are Sasha, Elsie, Echo, Ernie, Errol, Eddie and Eyke. I then took Sasha back to her carers Julie and Les near Bath. Here they are being reunited. 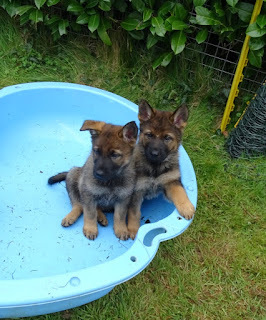 I will hopefully see the pups for their first training get together on Sunday 13th May and also for an appearance at the Devon county show. I would like to thank my wife Di for her support, patience and hard work helping me with the pups, welcoming and looking after the constant stream of visitors. I would like to thank Sasha’s carers Julie and Les for their dedication and sacrifice in looking after Sasha and being without her for 3 months. Thank you to my existing puppy walkers for their patience as I have neglected them for the last couple of months. Mark for looking after Ella and Chris for helping with the photographs on the last day. And finally thanks to Graham Mabbutt for carrying out the puppy assessments. Sasha’s pups are now 6 weeks old and will be undergoing their assessments this Friday 13th April. The last 6 weeks seem to have flown by and regardless of how many pups pass their assessments I am absolutely delighted with this group of pups. They are all very active forward pups with a strong attraction to people and they are very playful. Let me introduce them to you. Echo is an exact clone of her mum Sasha. She is a sweet natured gentle puppy who is happiest when she has a toy to carry around and has tremendous focus. Eddie from the word go has been the explorer who is the first to everything. He was the smallest pup in the litter but is catching up fast. Elsie has been of consuming interest to me because she was always the pup lying in between Sasha’s front legs in the early weeks. I wondered whether she may have been a bit clingy. Far from being clingy she is without doubt the toughest little character in the litter. She is a feisty forward driven pup who always has the last word in every exchange. Ernie is a puppy who just goes about his business without too much fuss and just gets on with life. He loves his cuddles and can be a bit vocal if he feels he is being ignored. Errol is the largest pup in the litter and is basically an eating machine. I give him more food than the rest and I watch him closely at feed times to stop him robbing the other pups of their food. Eyke is the escape artist. 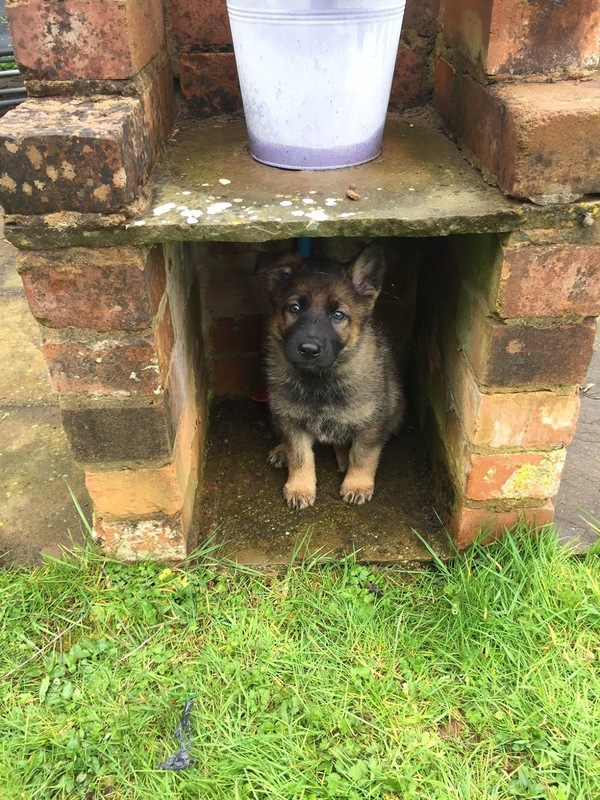 In 5 litters the only pup to climb over the side of the sleeping box was Donna from the D litter when she was 7 weeks old. Eyke was over the side at 5 and a half weeks. Here he is on the right looking over. He is now also coming over the top of the front drop down board which I have never had before. He is ferocious on his tugging and when he grabs my wellie boot it is impossible to get him to let go. The pups are now all on solid food 3 times a day and a small feed in the evening. With the exception of Echo they all practically inhale their food. Echo is just like her mother she likes to take her time eating her food. Because the others have finished their meals before she has hardly started I feed her in a separate area. As the pups became more active around 4 weeks I made their exercise area larger for them. and made sure that Sasha had a viewing area where she can relax and monitor the pups. She loves to spend time with her pups but because they have such sharp teeth she must be able to retreat when they become too rough. She alternates between going in with her pups, spending time on her viewing spot and when she wants to sleep, on her sofa. I have also added wood wool to the puppies run because this gives them somewhere to toilet and keeps the run much cleaner. The only problem is they like to lie in the wood wool and play in it. Here they are the day I introduced it. Sasha also enjoys romping in the wood wool with her pups. Unfortunately the weather has been atrocious and it has been a struggle getting them out. To get them used to changing to a new surface ie grass I started by carrying them and placing them in an outside pen with their mum to give them confidence. They were only just over 4 weeks old and mum surprised me by deciding she was going to give them a feed. With the birds singing in the back ground watching them was a wonderful experience. They then played chase with mum around the garden. By the time they had finished chasing mum they were very confident on the grass. This would prove to be very useful to me when I opened a larger secure grassed area for them to explore. The next job was to get them to come out from the conservatory themselves. The first day I opened the patio doors to allow them to make their own way out was very interesting. Eddie and Elsie were the first out. The rest were more cautious. I could have helped them out but I wanted to see who were the most adventurous and bold puppies in working out the problem for themselves. By the next day they were all out running around happily in the enclosed area outside the patio doors. This area was perfect for Sasha who could keep an eye on them from a raised wall. They were in this area for around 4 days before I opened it up to the rest of the garden. We have been extremely keen to make sure that Sasha always has access to her pups. Once the pups are on solid food and mum is no longer feeding a lot of breeders remove mum because it makes life easier. But as you will see from these videos in my opinion by doing this you are depriving mum of the opportunity to teach her pups valuable lessons and more importantly to enjoy the magical experience of bonding and enjoying her litter. At the end of the day mum has worked extremely hard to produce this litter for you and so it cannot be right to deny her such pleasure just for convenience. Once I opened up the rest of the garden this allowed them to explore and really burn off their excess energy. It is so much easier raising a litter with the longer daylight hours. Here they are venturing into their new area. Here they are after breakfast with mum in their favourite area by the garden shed. As always we have been inundated with requests to visit the pups and although it is hard work for my wife and I it is very much a case of the more the merrier. This is because it will go such a long way to developing their character and hopefully develop a positive experience of meeting people in the future. Being raised in the house definitely has its advantages with all of the various noises such as the TV, washing machine, hoover etc. I introduce the hoover initially while the pups are searching for food pellets. They eventually associate the noise of the hoover with food and completely ignore it thereby preventing attacks on hoovers or running and hiding. As we approach the assessments I keep being asked ‘who do I think will do well. It is difficult to say because on the assessments it will be the first time that they will have been assessed on their own as an individual. Up until now they have always been together in the group and on an assessment they will be on their own in a room they have never been before with someone they have never met before. Assessments are always surprising. The quietist in the group has been little Echo. She is the delicate eater and usually enjoys her own company and is very happy as long as she can carry a toy around. Everyone describes her as a pet but I think she is just like her mother Sasha. She is sensitive and happy to be cuddled but she will stick up for herself particularly if it involves someone trying to take her toy off her. I think she is the dark horse. Here she is with her mum. They do seem a very advanced litter and because they are so energetic I took them to the dog training school at the tender age of 5 and a half weeks. They travelled well and enjoyed meeting people in the school. Here I am arriving back home to take some very tired puppies for a well earned sleep. The pups were introduced to the ball pool this week and now we are having problems keeping them out. The worst offender is Elsie who keeps dive bombing in and out every opportunity she gets. 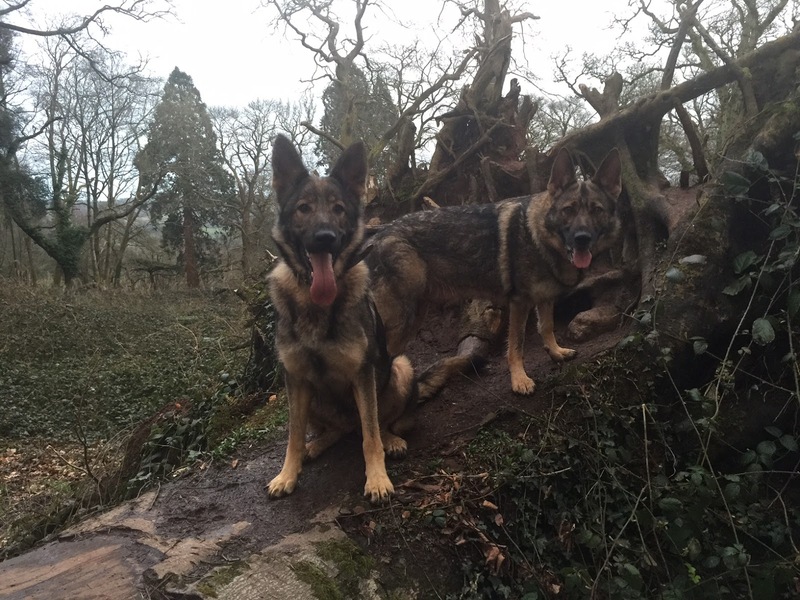 Here are the girls Echo and Elsie asking where have the balls gone. Fortunately Sasha gets on very well with my female Ella and we go for a walk every morning and evening in Killerton park. When I first started taking them out Ella would charge off and Sasha would walk with me. Now they charge around trying to outpace each other which has resulted in Sasha getting back into excellent condition. 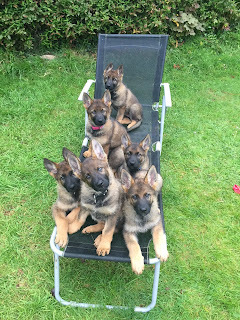 Next time I will update you on the assessments and which pups will be going to puppy walkers and which pups will be joining their new owners. From Sasha and her pups bye for now. Finally in amongst all the bedlam this week we also welcomed new pups Sydney and Star from Holland. Sydney and Star will be joining Bill, Ben and Lola on the January 2019 Initial Police dog course. 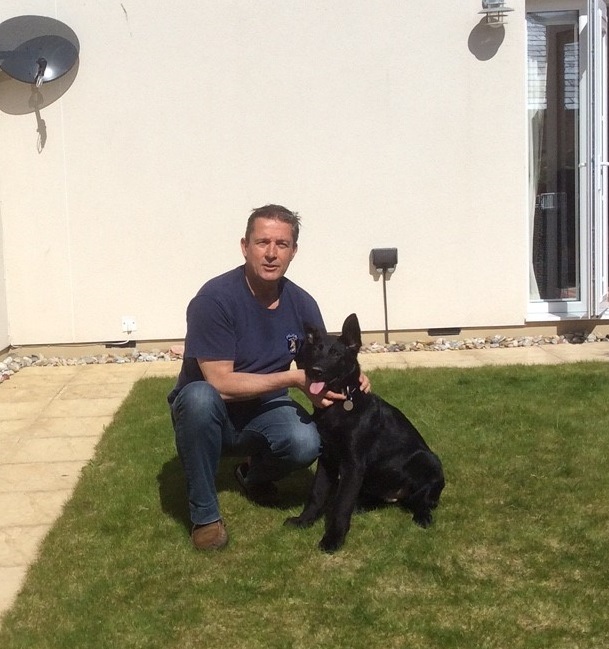 Sydney is pictured here with new puppy walker Phil Ash from Cornwall. Star is pictured here with puppy walker Margaret in Plymouth. Sydney and Star are brothers aged 15 weeks. They were bred by the world renowned breeder Koos Hassing of Tiekerhook kennels. We already have 2 dogs Rudy and Peppe from this breeder who are both doing well. From Sasha and her pups, Ella and me bye for now.